Showing 15 listings in Morrison. Show All Listings? Private developable 1/2 acre riparian property w/ aprx 100 ft of lakefront & concrete dock in prestigious SE Oakville. Build new 7500 sq ft. Rare opportunity to own lakefront paradise. Exquisitely designed gated residence by Grand Estate Homes was built for the owners refined standards and features 4 plus 1 bedrooms, 6.2 baths and boasts 8,792 sq ft of total finished living area. Artfully crafted modern custom home in SE Oakville. Energy-efficient smart home. Chef’s kitchen. Fully loaded lower level. Super stylish! 4.1 bdrms. 4,875 sq ft with 2,580 sq ft finished lower level. Chic, main level wine room. Home theatre, exercise room, sauna. Poolside pavillion, outdoor kitchen. Sunny, western exposure. 3-car garage. Stately 7,800 sq ft living in South East Oakville. Heated driveway & 3 car tandem garage with Tesla chargers & car lift. Home automation, wine cellar, wet bar & theatre. Magnificent residence on one of south east Oakville's most prestigious streets. Steps from the lake and short stroll to all downtown Oakville has to offer. 5.1 bedroom, 6.2 bathroom home in South East Oakville, built by renowned Hallmark Homes. This elegant home boasts a timeless exterior with stone and pre-finished copper accents. Super rare 1 acre lot with ideal proportions for the construction of an estate type home. 160' x 298' x 298' x 170'. Build a 2 storey home of up to 14,000 sf. Keeran Design with almost 7,100 sq ft of total living space. Located in Oakville’s most desirable pockets this home creates a stylish atmosphere that will impress. A seamless blend of old world charm and new style, this architectural gem mixes traditional style with forward thinking lifestyle design. Over 6,800 square feet of living space span three levels, with 4,700 square feet above grade. Beautiful modern home built by Gatestone Homes. 4.1 Beds and 5.2 Baths and over 6,100 sq ft of living space. Stunning backyard with covered porch and in-ground pool. Tastefully renovated and located at the end of a quiet court in Morrison. With over 3,000 sq. ft., this home has an open concept plan with easy transitions between rooms. 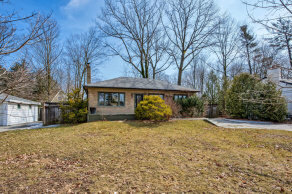 Fabulous private 100' X 150' west exposed building lot with mature trees located in South East Oakville’s most desired neighbourhood - Morrison. Increasingly rare opportunity to build your dream home on a great street in Morrison. Build over 3,400 sq ft of living space. 1 year or longer lease option. Newly renovated and updated t/o. New baths, floors and paint. Updated kitchen. Large FR. Two rec rooms, formal LR and DR.